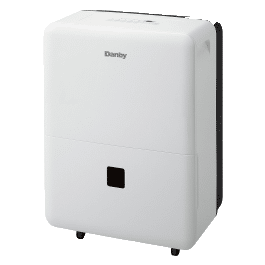 Eva-dry-1100 Electric Petite Dehumidifier is an electric, mini-capacity, compact dehumidifier available in the market. This dehumidifier unit is ideal for places of 1,100 cubic feet. Eva-dry edv-1100 electric petite dehumidifier not just eliminates moisture but serves other purposes as well. This unit has been devised with latest technology which makes it quite efficient despite the compactness. It manages to collect more than 8 ounces of water per day which makes it the best dehumidifier for basement. 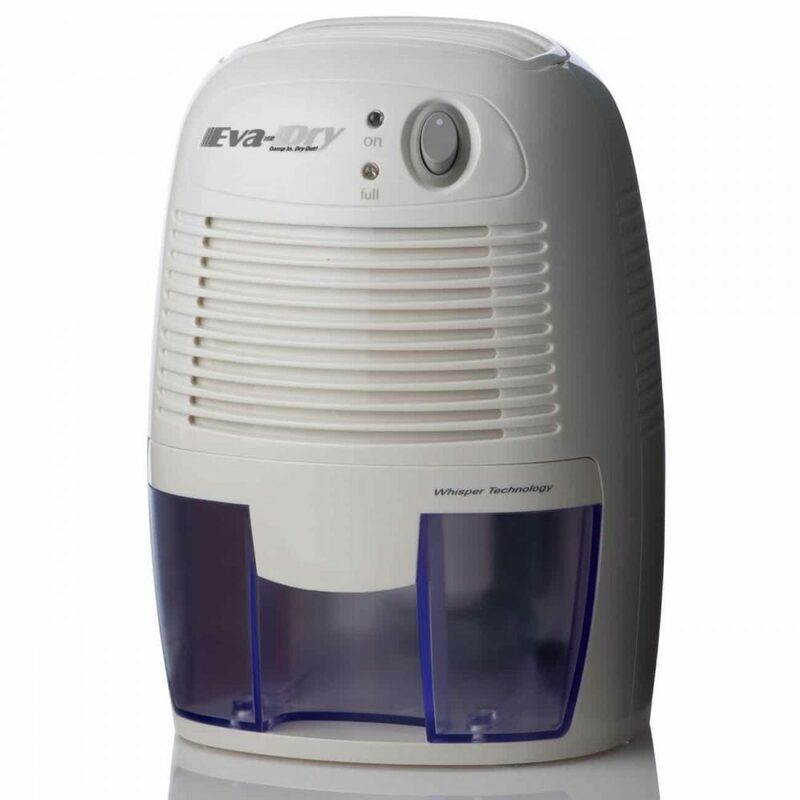 Read this Eva-dry Edv-1100 Petite Dehumidifier review to know more about this petite dehumidifier. Eva-dry-1100 Electric Petite Dehumidifier is available in the market in compact size which is perfect for closets, bathrooms and R.V.s. Manufacturer of Eva-dry-1100 Electric Petite Dehumidifier uses Peltier Technology which means it has no compressor. Dimension of the product is 6.5 x 5.3 x 8.5 inches. It is light in weight and quiet. The Eva-dry EDV-1100 electric petite dehumidifier has been designed based on the Peltier Technology. This renders Eva dry 1100 quiet while in operation. The unit consist of ceramic plates where one plate is heated and the other is cooled. When air enters the unit, it moves from the heated plate to the cooler one. This leads to condensation. This unit does not have much mechanical parts like other refrigerant dehumidifiers. This makes an ideal bathroom dehumidifier or a small room dehumidifier of 1100 cubic feet. This unit is compact in size and can be placed even on a workbench or desk. The moisture is extracted from air and stored in a reservoir that is spill-proof. This compact unit can be placed anywhere on the floor, shelves, on tables or on any other flat surface. The manufacturers claim that this dehumidifier unit helps in removal of major moisture from spaces. The unit also eliminates the issues pertaining mold and mildew. This unit is capable of keeping must odors at bay. If you check out other dehumidifier reviews, you will find that this petite unit is capable of doing a lot more than expected. The unit is compact and simple in design. This makes it quite affordable. 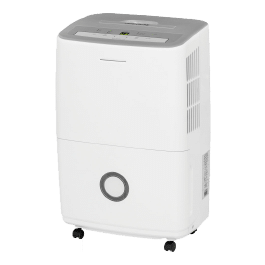 Read this Eva-dry Edv-1100 Petite Dehumidifier review to know further about how this affordable unit is effective when it comes to operation. This dehumidifier unit features a 16 oz. reservoir. This can slide out or in easily making the process much more convenient for the users. The user just needs to pull the unit, dump the water and place it back into the unit. The users do not really have to bother about anything while using this dehumidifier unit. Once the reservoir is full, the device turns off on its own and an indicator light signals the users that the reservoir needs to be emptied. Hassel free Drainage system is one of the well-known conveniences offered by Eva-dry Edv-1100 Petite Dehumidifier. This dehumidifier has a 16 oz. reservoir. Once the reservoir is full, the device automatically turns off and an indicator light gets on to inform users of this. The user just needs to pull the unit, dump the water and place it back into the unit. This Eva-dry Edv-1100 Petite Dehumidifier review highlights all the amazing features that this dehumidifier unit has to offer. When compared to other dehumidifiers for sale, this unit is light in weight and very portable. This dehumidifier is simple in operation as there no complicated units incorporated in designing. Eva-dry Edv-1100 electric petite dehumidifier is highly effective when it comes to operation. This dehumidifier unit draws little electricity and thus saves a lot of money on electricity bills in comparison to other dehumidifier. This in turn offers you the comfort you need without creating much impact on the environment. The Eva-dry edv-1100 electric petite dehumidifier needs to be registered within 30 days from the date of purchase for the activation of the warranty feature with the manufacturer. The warranty is offered for a limited period against manufacturer’s defect. The warranty would not be valid if this has been repaired or taken apart by anybody apart from the manufacturers. Replacements parts are available for this dehumidifier unit. This can be purchased from the official website of the manufacturer or from reputed sellers. The service center can be contacted for any form of help that is being sought in getting the parts replaced. 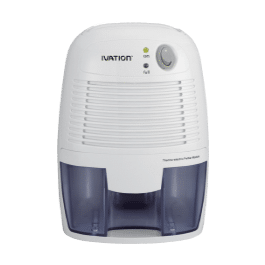 If you are looking for a small, space specific dehumidifier that works quietly from a corner in your room, then Eva-Dry EDV-1100 electric petite dehumidifier is an ideal choice for you. The design and the size offer ease of operation and also renders this unit portable. This is one of the cheapest dehumidifier available in the market. The reservoir is removable and hence makes it easy for replacement and cleaning. The auto shut off feature makes it a wonderful option. 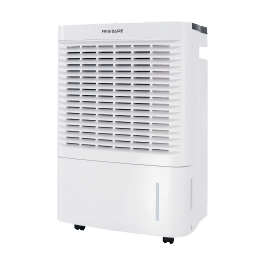 This Eva-dry Edv-1100 Petite Dehumidifier review makes it evident that the unit is ideal for individual rooms or small houses. This fits well in bathrooms and basements. 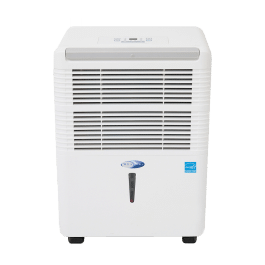 The unit deals with moisture in a very effective manner thereby earning excellent dehumidifier ratings in almost all Eva dry dehumidifier reviews by the users. 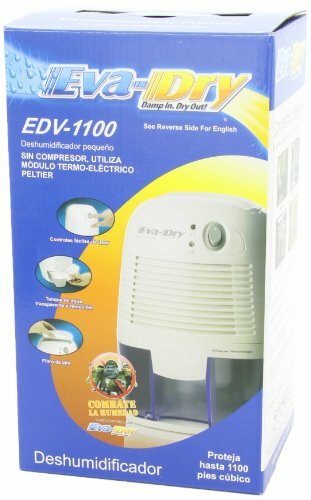 This Eva-dry Edv-1100 Petite Dehumidifier review offers step by step procedure for using this unit. The steps can be followed to ensure that the users do not face any hassles while operating the unit. Unpack the unit from the box. Locate a power jack. Plug the adapter into a standard outlet you can find in the room which you wish to eliminate moisture from. Turn on the switch. Check the dry air outlet for testing the airflow. This would ensure that the device has started operation. The device would turn off automatically owing to the auto-shut off feature employed in designing the unit. The switch has to be turned off for manually stopping the operation of this dehumidifier unit. A yellow LED light indicates that the reservoir of your dehumidifier unit is full. For emptying the tank, the power supply has to be shut down. The tank then needs to be removed from the unit. The tank needs to be placed back after discarding the water. The unit can again be used by turning on the switch. While carrying out cleaning of unit, ensure that the power is switched off. Employ a soft cloth for wiping the surface. A brush can be used for dusting the grill. Hope you were one of them! Quiet and efficient, the Eva-Dry EDV-1100 Petite Dehumidifier is a mini-capacity powerhouse that works in rooms up to 110 square feet. Thanks for sharing your thought. Did you have any additional preference while choosing your dehumidifier?